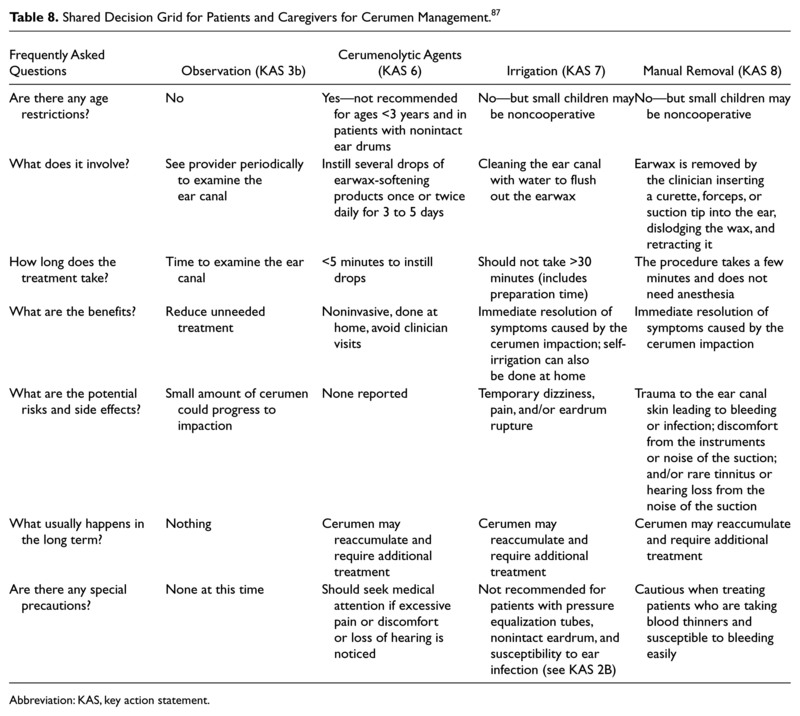 Home ENT Cerumen Impaction: an Update. in 2017 the American Academy of Otolaryngology – Head and Neck Surgery released new guidelines for the management of cerumen impaction. 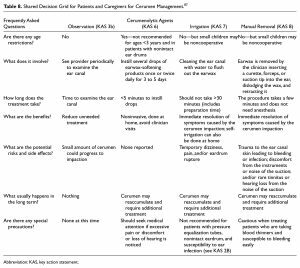 3 new key action statements on managing cerumen impaction that focus on primary prevention, contraindicated intervention, and referral and coordination of care. In the symptomatic patient, the goal of intervention is to help alleviate or relieve the symptoms (pain, fullness, hearing loss, tinnitus, etc). 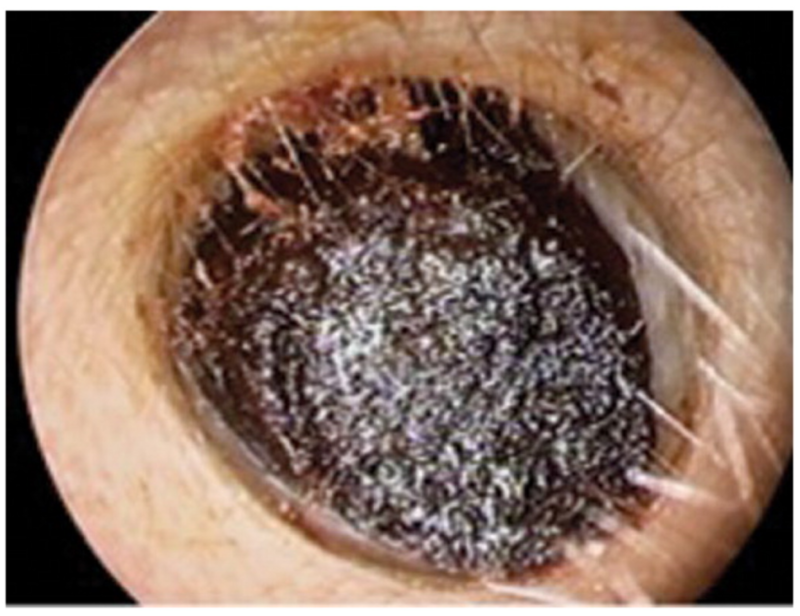 In the asymptomatic patient with impacted cerumen, the goal is to allow visualization of the ear canal and the tympanic membrane or perform audiometric or vestibular evaluations. Several methods for achieving these goals are widely used. However, evidence in the literature that clearly identifies the superiority of one therapeutic option versus another is lacking. (1) irrigation, (2) cerumenolytic agents, and (3) manual removal requiring instrumentation. Combining ≥1 of these options on the same day or at intervals is routinely used in everyday practice. There are no comparative randomized clinical trials addressing the relative effectiveness of the 3 methods. What are the various types of cerumenolytic agents? I’ve had pretty decent success using a 60cc syringe and attaching a cut off 20 gauge IV catheter (cut so that it can’t perforate the TM), filling it with tepid water, and then attempting high pressure irrigation. Repeat PRN. Since there’s not a whole lot of evidence suggesting a difference between manual removal, irrigation, and cerumenolysis.. I’ll probably just keep doing that. What about you?